Although based in part on data provided under license by the QuintilesIMS MIDAS™ Database, the statements, findings, conclusions, views and opinions expressed in this report are exclusively those of the PMPRB and are not attributable to QuintilesIMS. 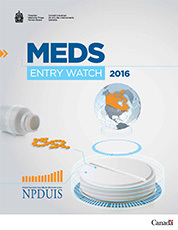 The PMPRB’s Meds Entry Watch explores the market entry dynamics of new drugs in Canadian and international markets. Building on the retrospective analysis included in the first edition, this report focuses on new active substances (NASs) that received market approval through the US Food and Drug Administration (FDA), the European Medicines Agency (EMA) and/or Health Canada in 2015 and 2016, and analyzes their uptake, pricing, sales and availability as of the last quarter of 2016 (Q4-2016). The methodology in this edition has been updated to provide a more apples-to-apples comparison of the number of drugs launched in Canada and in international markets. The sales and pricing data for all NASs is based on MIDAS™, as in the previous edition. This publication informs decision makers, researchers and patients of the evolving market dynamics associated with emerging drug therapies in the Canadian and international pharmaceutical environment. The international markets examined include the seven countries the PMPRB considers in reviewing the prices of patented drugs (PMPRB7): France, Germany, Italy, Sweden, Switzerland, the United Kingdom and the United States. Some of the analyses also include other countries in the Organization for Economic Co-operation and Development (OECD). Important new drugs have been launched since 2009, generating nearly one quarter of brand-name drug sales in Canada by 2016. Canada launched more new drugs than most OECD countries, but fewer than all PMPRB comparator countries, including many with lower average patented drug prices. Orphan drugs are increasingly dominating the new drug landscape, accounting for 54% of new drugs entering the market in 2015 and 42% in 2016, a significant increase from the 33% average share between 2009 and 2014. Over one quarter of the new drugs in 2015 and 2016 were developed for the treatment of cancer and came with a high cost, averaging $13,000 for a 28-day treatment. 1. A greater than average number of new active substances (NASs) were launched in 2015, many of which were higher-cost specialty drugs. 41 NASs received market approval through the FDA, the EMA and/or Health Canada in 2015, exceeding the average annual rate of 35 drugs launched from 2009 to 2014. Many new drugs came with a high cost: 35% were oncology drugs with costs exceeding $5,000 for a 28-day treatment and 30% were non-oncology drugs with costs exceeding $10,000 per year. Of the NASs assessed by the PMPRB, only two demonstrated more than a moderate level of therapeutic improvement. 2. Fewer drugs were approved for market in Canada than in the US and Europe in 2015, although Canada still ranked well in terms of sales. Approximately half (20) of the 41 NASs launched in 2015 were approved for sale in Canada in 2015, compared to 76% (31) approved by the EMA and 98% (40) by the FDA. 14 of the 20 NASs recorded sales in Canada by the end of 2016, placing Canada tenth in the OECD, lower than most other PMPRB7 countries but higher than Italy. These drugs represented 80% of the total NAS sales for the OECD, suggesting that the higher-selling drugs were approved in Canada. 3. Oncology and HIV drugs accounted for the majority of NAS sales in 2016. Overall, sales for NASs were highly concentrated, with antineoplastic drugs (to treat cancer) and antivirals together accounting for over 65% of NAS sales in Canada and the PMPRB7 in Q4-2016. There were 14 new cancer agents launched in 2015, accounting for over one third (35%) of NAS sales in Canada and the PMPRB7 by Q4-2016. An antiviral for HIV was the top-selling NAS in Q4-2016, accounting for 32% of NAS sales in Canada and the PMPRB7. 4. 2016 was a less active year for drug launches. 31 NASs received market approval through the FDA, the EMA and/or Health Canada in 2016, significantly fewer than in 2015. 5. As in previous years, many of the specialty drugs had high treatment costs. Of the NASs launched in 2016, nearly half (13) received an orphan designation from the FDA and/or the EMA. Thirteen of the NASs launched in 2016 were classified as biologics, and 5 of the new launches were oncology productsFootnote 1. The next edition of this publication will build on this analysis to provide further insight into the drugs introduced in 2016 and identify new drugs approved in 2017. Meds Entry Watch is an annual PMPRB publication that explores the dynamics of new drugs entering Canadian and international markets. It provides detailed information on the availability, launch timing, market penetration, sales and prices of these new active substances (NASs). The first edition of this report provided a retrospective analysis of new drugs launched in Canada and the seven PMPRB comparator countries from 2009 to 2014. Building on these general trends, this edition focuses on NASs that received market approval through the US Food and Drug Administration (FDA), the European Medicines Agency (EMA) and/or Health Canada in 2015 and 2016, and analyzes their market impact as of the last quarter of 2016 (Q4-2016). This approach differs from that employed in the previous edition, which relied on the first reported sales in MIDAS™ to establish the launch date of a new drug in international markets, and thus was subject to limitations related to data reporting. Sales and pricing data for all NASs is reported based on MIDAS™, as before. The content of this edition has also been enhanced to provide a more apples-to-apples comparison of drug availability across countries, based on either market approvals or sales. This allows for a more appropriate assessment of Canada’s relative position internationally, as it uses a consistent approach for comparing the number of drug launches across international markets. This report consists of three main parts: Part A provides a high-level review of long-term trends from 2009 to 2015; Part B focuses on NASs that received market approval in 2015; and Part C presents a preliminary analysis of the drugs approved in 2016. The information in this publication informs decision makers, researchers and patients of the evolving market dynamics of emerging drug therapies in the Canadian and international pharmaceutical environment. For the purpose of this study, drugs were reported at the active chemical substance level and are referred to as active substances (NASs). This edition focuses on NASs that received market approval through the US Food and Drug Administration (FDA), the European Medicines Agency (EMA) and/or Health Canada in 2015 and 2016. Using these criteria, 41 new drugs were selected for the analysis of 2015 NASs in Section B and 31 drugs were identified for the preliminary analysis of 2016 NASs in Section C. The availability of these drugs in Canada and in international markets was assessed as of the end of 2016. The international markets examined include the seven countries the PMPRB considers in reviewing the prices of patented drugs (PMPRB7): France, Germany, Italy, Sweden, Switzerland, the United Kingdom (UK) and the United States (US). Some of the analyses also include additional countries in the Organisation for Economic Co-operation and Development (OECD). The main data source for drug sales and pricing was the QuintilesIMS MIDAS™ Database (all rights reserved). MIDAS™ data reflects the national retail and hospital sectors for each country and includes drug sales, list prices and the physical quantity of drugs used in the public, private and out-of-pocket market segments. The Canadian and international prices reported in MIDAS™ are manufacturer ex-factory list prices. Sales and volume data encompass all versions of a substance available in a particular country, produced by any manufacturer in any strength and form. Market spot exchange rates were used to convert foreign currency prices into their Canadian dollar equivalents. Foreign currencies were converted to Canadian dollars using the 12-month or 3-month average exchange rate for the year or quarter, respectively. Treatment costs were calculated using Canadian prices if available; otherwise the foreign median price or available foreign price was used. Information on dosing regimens was taken from the product monograph provided by Health Canada (HC) or the FDA/EMA if not available. For information on the definition and calculation of the measures of central tendency and average foreign-to-Canadian price ratios, see the Reference Document section of the Analytical Studies page of the PMPRB website. In the first edition of Meds Entry Watch, a NAS was only considered to be launched once sales data was recorded in the QuintilesIMS (now IQVIA) MIDAS™ Database. This approach excluded drugs that were available on the market but lacked recorded sales data, which could have resulted from a variety of circumstances, such as receiving market approval late in the calendar year, recording very low sales, or simply having sales that were not recorded. It also meant that the number of NASs identified in any given year could change, as first sales were recorded in subsequent years. The new selection criteria, which rely on market approvals, provide a more complete and consistent list of the new drugs introduced in relevant markets in any given year, and since it is not based on the sales record, the number of drugs will remain fixed from year to year. The NASs identified for 2015 and 2016 in this edition reflect this new approach. New active substances (NASs) were selected for analysis based on their date of market approval by the FDA, the EMA and/or Health Canada; however, some of these drugs may have an earlier approval date in other international markets. Also, the NASs included in this analysis do not necessarily represent all of the new drugs introduced in 2015 and 2016, as other national regulatory bodies (not examined in this report) may have approved additional drugs. Nevertheless, this should have very little effect on the results, as the FDA and EMA are major regulatory bodies representing very large international markets and have regulatory approaches that are similar to those in Canada. Drugs with low sales may not be reported in the MIDAS™ Database, and thus the sales of NASs in any given country may be slightly under-reported. However, this should only have a minimal impact on the overall results. Canadian and international sales and prices available in the QuintilesIMS MIDAS™ Database are estimated manufacturer factory-gate list prices and do not reflect off-invoice price rebates and allowances, managed entry agreements, or patient access schemes. Manufacturer list prices may be different from other price points in the distribution chain, such as wholesaler or pharmacy retail prices. The methodology that MIDAS™ uses for estimating drug prices varies by country depending on the distribution system and the availability of public data. This data includes the manufacturer’s list price, the wholesale price and the pharmacy price in specific markets. Manufacturer, wholesale or retail prices may represent estimates based on assumed regulated margins and/or markups. The variations in availability and uptake among countries may be due to differences in relevant market considerations, such as the demographic and disease profiles of the populations, or regulating and/or reimbursement policies. International sales and pricing data are heavily skewed towards the United States due to its relatively large population, and as a result, the ranking of drugs by international sales generally reflects the order of drug sales in the United States. Drugs accessed through special access programs are not captured in this report. New drugs launched since 2009 accounted for nearly one quarter of brand-name drug sales in Canada by the end of 2016, with orphan drugs increasingly dominating the new drug landscape. Half of the drugs entering the Canadian and/or PMPRB7 markets from 2009 to 2015 had recorded sales in Canada by Q4-2016. This placed Canada eleventh in the OECD in terms of the number of new active substances (NASs), behind all other PMPRB7 countries, many of which had lower average patented drug prices. Despite this, Canada ranked third in terms of the share of sales, suggesting that most of the top-selling substances were approved. In 2015, 41 new active substances (NASs) received market approval through the US Food and Drug Administration (FDA), European Medicines Agency (EMA) and/or Health CanadaFootnote 2, exceeding the yearly average of 35 reported from 2009 to 2014 (Figure A1). Over half of these drugs received an orphan designation from the FDA and/or EMA, higher than the 33% average share from 2009 to 2014 and 17% in 2009. In contrast, 2016 was a much less active year in terms of market approvals, with 31 NASs available in Canada and the PMPRB7. Nevertheless, the share of orphan drugs (42%) continued to be high, supporting the increasing trend observed over the last several years. This bar graph depicts the number of new active substances launched in Canada and the PMPRB7 from 2009 to 2016. The number of molecules introduced between 2009 and 2014 is averaged. A table shows the share of orphan and oncology drugs for each annual total. Note: In 2015 and 2016, a NAS was considered to be launched if it received market approval by the US Food and Drug Administration (FDA), the European Medicines Agency (EMA) and/or Health Canada (HC). *France, Germany, Italy, Sweden, Switzerland, United Kingdom and the United States. Source: MIDAS™ Database, 2009 to 2016, QuintilesIMS. All rights reserved. Cumulatively, NASs have had a steep year-over-year uptake in sales. By Q4-2016, the NASs launched from 2009 to 2015 reached 27.9% of the total brand-name pharmaceutical market for Canada and the PMPRB7 combined, and 23.6% for Canada alone (Figure A2). In any given year, the impact of NASs on pharmaceutical sales depends on the number and therapeutic relevance of the drugs. For example, NASs launched in 2014 had a very high impact on sales, mainly driven by the new direct-acting antiviral (DAA) treatments for hepatitis C.
The initial uptake for NASs launched in 2015 was generally higher than the average in previous years. For Canada and the PMPRB7, NASs that received market approval in 2015 accounted for 2.8% of all pharmaceutical sales in Q4-2016, whereas the average share of sales in the first year after introduction, excluding hepatitis C products, was 0.9% for NASs launched between 2009 and 2014. This figure consists of two area graphs depicting the new active substance cumulative share of total brand-name drug sales by launch year. It tracks the percentage of new drug launches in yearly sales up to the fourth quarter of 2016. New active substance share of sales for each year are also marked. The first graph is for both Canada and the seven PMPRB comparator countries and the second is for Canada alone. Note: A NAS was considered to be launched if it received market approval by the US Food and Drug Administration (FDA), the European Medicines Agency (EMA) and/or Health Canada (HC). Source: MIDAS™ 2009 to 2016, QuintilesIMS. All rights reserved. Of the 252 NASs launched in Canada and the PMPRB7 from 2009 to 2015, 50% recorded sales in Canada by Q4-2016 (Figure A3). Although this represented a greater share than the OECD median of 43%, it was less than all of the other PMPRB7 countries, many of which have lower average patented drug prices (PMPRB Annual Report). Despite this, Canada ranked third in terms of the share of OECD sales for these drugs in Q4-2016. Canada’s 93% share of sales was significantly higher than the OECD median of 78% and greater than most other PMPRB7 countries except for the US and the UK. This suggests that the higher-selling NASs were launched in Canada, which may have been partially influenced by its proximity to the US. This is a split bar graph. For each country in the Organisation for Economic Co-operation and Development, one side of the graph gives the market share of the new drugs launched in Canada and its seven PMPRB comparator countries from 2009 to 2015. The other side gives the respective share of the Organisation for Economic Co-operation and Development sales in the fourth quarter of 2016. The Organisation for Economic Co-operation and Development median is shown for each side of the graph. Note: Sales are based on manufacturer list prices and include sales for all OECD countries. While a relatively large number of NASs were launched in 2015, significantly fewer were approved for market in Canada than in the US and Europe by the end of 2016. Oncology drugs made up approximately one third of all new drug launches most came with a high cost. Many new active substances (NASs) offered only moderate, slight or no therapeutic improvement over their comparator products. 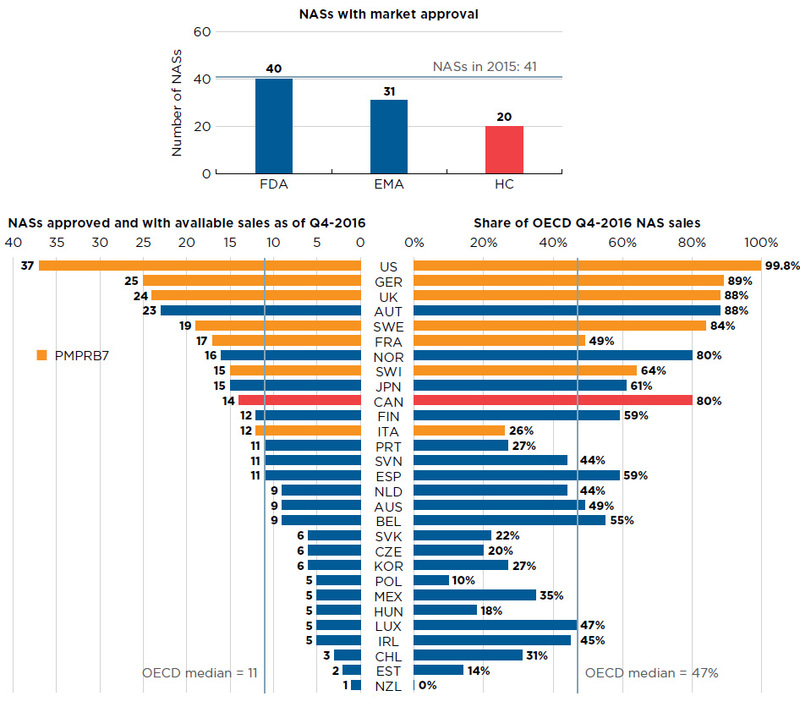 Approximately half of the 41 NASs launched in 2015 received market approval through Health Canada (20), much fewer than through the FDA in the US (40) and the EMA in Europe (31), which are two of the largest international markets (Figure B1).Footnote 3 Note that market approval through the EMA does not mean drug availability in any given European country. Of the 20 drugs approved in Canada, 14 had sales data available in MIDAS™ by Q4-2016. This placed Canada tenth in the OECD in terms of the number of new drugs sold and sixth in terms of the corresponding OECD NAS sales at 80%. The US market recorded sales for 37 of the drugs approved in 2015, representing 99.8% of OECD sales. These results reflect the initial market penetration of NASs in Canada. The rate of sales for NASs is expected to increase in subsequent years. Section 1: This is a bar graph depicting the number of new active substances with market approval from three groups: the Food and Drug Administration in the United States, the European Medicines Agency and Health Canada. Section 2: This is a split bar graph showing the number of new active substances approved and with available sales as of the fourth quarter of 2016 and the corresponding share of 2016 fourth quarter sales in 29 countries. The Organisation for Economic Co-operation and Development median is shown for each side of the graph. Note: Based on drugs that received market approval through the US Food and Drug Administration (FDA), the European Medicines Agency (EMA) and/or Health Canada in 2015 with recorded sales data as of Q4-2016. 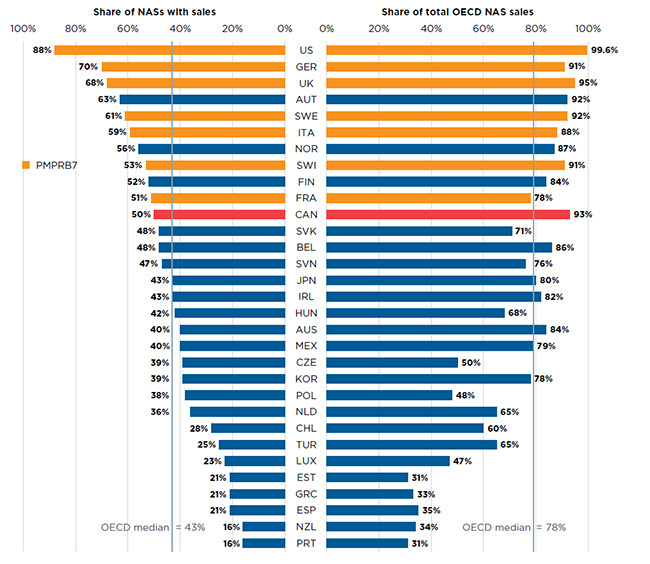 Sales are based on manufacturer list prices and include sales for selected NASs in all OECD countries. Source for sales data: MIDAS™ Database, 2015 and 2016, QuintilesIMS. All rights reserved. Although the NASs launched in Canada and the PMPRB7 in 2015 covered a wide range of therapeutic classes, their sales were highly concentrated. The 2015 new drug list was dominated by antineoplastic agents, with 14 of the 41 NASs belonging to that class. These drugs accounted for the largest share of new drug sales in Q4-2016 (35%), with Ibrance and Darzalex being the top contributors. Antiviral drugs for HIV with the active substance tenofovir alafenamide (e.g., Genvoya) accounted for the largest individual share of NAS sales (32%). Table B1 lists the NASs launched in 2015. For each drug, the country with first reported sales is given, along with the availability in Canada and share of sales in Q4-2016. Note that this information reflects the emerging uptake and availability of these products, and some NASs with market approval may not have recorded sales by Q4-2016. Note: A NAS was considered to be launched if it received market approval through the US Food and Drug Administration (FDA), the European Medicines Agency (EMA) and/or Health Canada in 2015. †Level 2 of the Anatomical Classification of Pharmaceutical Products, as reported by the QuintilesIMS. ‡B, biologic; C, cancer; O, orphan drugs. §Notice of Compliance issued as of December 31, 2016. Source: MIDAS™ Database, October-December 2016, QuintilesIMS. All rights reserved. Table B2 provides details on the assessments and recommendations for 2015 NASs that received market approval in Canada. As determined by the PMPRB’s current price review process, one of the NASs launched in 2015 (Strensiq) was deemed to be a breakthrough drug, one NAS (Entresto) offered a substantial improvement, three offered a moderate improvement, while five were deemed to offer slight or no improvement over existing drugs, and one offered a moderate as well as a slight or no improvement depending on the indication. The other nine drugs available in Canada had not been reported to the PMPRB or their level of therapeutic improvement had not yet been assessed and made publicly available by the end of 2016Footnote 4. The majority of the NASs are currently under consideration for funding by the various public drug plans. By the end of 2017, eight out of the 10 drugs reviewed by the Common Drug Review (CDR) received a recommendation of list with criteria/condition. One drug (Genvoya) received a recommendation to list and another one (Orkambi) received a do not list recommendation. Four of the oncology drugs reviewed by the pan-Canadian Oncology Drug Review (pCODR) received a recommendation for funding on the condition that their cost effectiveness was improved to an acceptable level, while two were not recommended for funding. One drug received the two aforementioned recommendations for different indications. The pan-Canadian Pharmaceutical Alliance (pCPA) price negotiation status is also indicated in Table A2. Of the 20 NASs available in Canada, negotiations were completed or active for 12 of the drugs, while for four drugs negotiations have been closed without agreement or there was a decision not to negotiate. The four remaining drugs have not yet been considered by the pCPA. Many 2015 NASs came with very high treatment costs and more than half were designated as orphan drugs by the FDA and/or the EMA. Of the 41 NASs, approximately one-third were oncology drugs with an average cost of approximately $13,000 per 28-day treatment. † Level 2 of the Anatomical Classification of Pharmaceutical Products, as reported by the QuintilesIMS. ‡ B, biologic; C, cancer; O, orphan drugs. § As of December 31, 2017. ** This drug has not yet been reported to the PMPRB or its level of therapeutic improvement has not yet been assessed and made publicly available by the end of 2016. Table B3 reports, where available, the prices and treatment costs for NASs launched in Canada and the PMPRB7 in 2015 as of Q4-2016. The prices are reported for the highest selling form and strength of each drug at the time of the analysis. Many NASs were high-cost drugs: 35% were oncology drugs with costs exceeding $5,000 for a 28-day treatment and 30% were non-oncology drugs with costs exceeding $10,000 per year. Many of them far exceeded this $10,000 cost, resulting in an average treatment cost close to $80,000. Note:A NAS was considered to be launched if it received market approval by the US Food and Drug Administration (FDA), the European Medicines Agency (EMA) and/or Health Canada in 2015. Recently launched NASs may not yet have price information available in MIDAS™. Prices reported are manufacturer list prices. §Treatment costs were calculated using Canadian list prices if available, otherwise the foreign median price or available foreign price was used. Information on dosing regimens was taken from the product monograph provided by Health Canada (or the FDA/EMA if unavailable though HC). 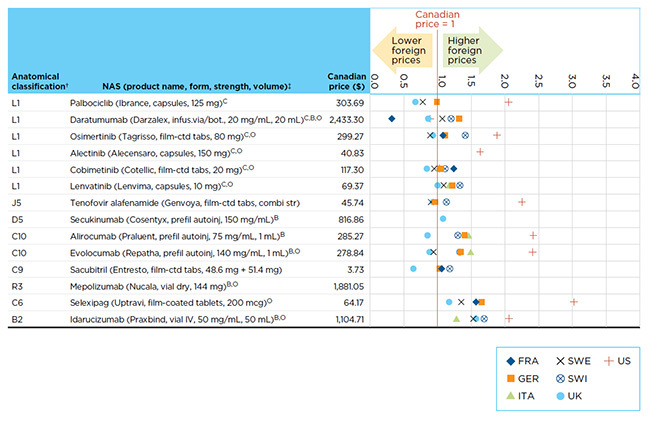 ** Unit price from CADTH's Canadian Drug Expert Committee Recommendation report. †† Unit price from pCODR Expert Review Committee (pERC) Recommendation report. ‡‡ Unit price from the 2016 Pricing Monitor report. Source: MIDAS™ Database, October–December 2016, QuintilesIMS. All rights reserved. Canadian prices for new drugs are generally in line with those observed in European markets and considerably below those in the US market. Figure B2 reports the Q4-2016 bilateral foreign-to-Canadian price ratios for the NASs launched in Canada and the PMPRB7 in 2015 with Canadian price data available in MIDAS™. Prices are reported for the highest selling form and strength of each drug at the time of the analysis. The results are expressed as an index with the Canadian price set to a value of one and the international measures reported relative to this value. For example, a result above one indicates a correspondingly higher average price in the specific foreign market. The limited range of results highlights a trend towards international list price uniformity at introduction. This figure maps the price ratios for new active substances launched in Canada and the PMPRB7 to show lower and higher foreign price comparisons as of the fourth quarter of 2016. Note: A NAS was considered to be launched if it received market approval by the US Food and Drug Administration (FDA), the European Medicines Agency (EMA) and/or Health Canada in 2015. Recently launched NASs may not yet have price information available in MIDAS™. For presentation purposes, the scale reporting the foreign-to-Canadian price ratio was limited to 4.0; observations higher than this value are not depicted here. † Level 2 of the Anatomical Classification of Pharmaceutical Products, as reported by QuintilesIMS. Thirty-one new active substances (NASs) received market approval through the US Food and Drug Administration (FDA), the European Medicines Agency (EMA) and/or Health Canada in 2016, fewer than the average in recent years. Many of the NASs launched in 2016 were orphan drugs (13) and/or oncology products (5), including biologics (13). An analysis of these products suggests that the most expensive new orphan drugs had treatment costs in the hundreds of thousands of dollars. Table C1 lists the 31 NASs launched in 2016. For each drug, the country with first reported sales is given, along with the availability in Canada and share of sales in Q4-2016 for countries with available sales data. Note that this information reflects the early availability and uptake of these products in the markets analyzed. Note: A NAS was considered to be launched if it received market approval through the US Food and Drug Administration (FDA), the European Medicines Agency (EMA) and/or Health Canada in 2016. Sales are based on manufacturer list prices. †B, biologic; C, cancer; O, orphan drugs. ‡Level 2 of the Anatomical Classification of Pharmaceutical Products, as reported by the QuintilesIMS. §Notice of Compliance issued as of December 31, 2017. Health Canada New Drug Authorizations: 2016 Highlights. Table C2 reports the Q4-2016 prices and treatment costs for the NASs launched in Canada and the PMPRB7 in 2016 with data available in MIDAS™. Prices are reported for the highest selling form and strength of each drug. Nearly three-quarters of the 2016 NASs with available sales had treatment costs exceeding $10,000 (annual or regimen): 12 out of the 17 NASs (71%). Note: A NAS was considered to be launched if it received market approval through the US Food and Drug Administration (FDA), the European Medicines Agency (EMA) and/or Health Canada in 2016. Sales are based on manufacturer list prices. * France, Germany, Italy, Sweden, Switzerland, United Kingdom and the United States. † B, biologic; C, cancer; O, orphan drugs. ‡ Treatment costs were calculated using Canadian list prices if available, otherwise the foreign median price or available foreign price was used. Information on dosing regimens was taken from the product monograph provided by Health Canada (or the FDA/EMA if unavailable though HC). § Unit price from pCODR Expert Review Committee (pERC) Recommendation report. †† Treatment cost is $1,761.13 per 28-day course for the ramp-up stage and $7,615 per 28-day course for subsequent cycles. a ‒ Dosage and duration of treatment with IDELVION depends on the severity of the Factor IX deficiency, the location and extent of bleeding and the patient’s clinical condition, age and recovery of Factor IX. b ‒ The dose and duration of the substitution therapy depend on the severity of the factor VIII deficiency, the location and extent of the bleeding and the patient's clinical condition. The next edition of Meds Entry Watch will provide a more detailed analysis of the NASs launched in 2016. Note: Indications from: 1 Health Canada (HC); 2 US Food and Drug Administration (FDA); 3 European Medicines Agency (EMA). Source: FDA, EMA, and HC websites. Source: MIDAS™ Database, 2015 and 2016, QuintilesIMS. All rights reserved; FDA Novel Drugs 2016; EMA Human Medicines Highlights 2016; Health Canada New Drug Authorizations: 2016 Highlights; FDA, EMA and HC websites. Bezlotoxumab (Zinplava)B Indicated to reduce recurrence of clostridium difficile infection (CDI) in patients 18 years of age or older who are receiving antibacterial drug treatment of CDI and are at a high risk for CDI recurrence.2 Merck & Co.
Zalmoxis (nalotimagene carmaleucel)C,B,O Used as an add-on treatment in adults who have received a haematopoietic stem cell transplant (HSCT, a transplant of cells that can develop into different types of blood cells) from a partially matched donor (a so-called haploidentical transplant).3 MolMed S.p.A. Source: FDA Novel Drugs 2016; EMA Human Medicines Highlights 2016; Health Canada New Drug Authorizations: 2016 Highlights; FDA, EMA and HC websites. Note that a single molecule may fall into more than one category, thus there may be some overlap in the counts. This is higher than the number reported in the first edition of Meds Entry Watch, which was based on first recorded sales rather than market approvals. For more details on the change to the methodology, see the Methods section. Drug launches in the first edition of Meds Entry Watch were based on first recorded sales rather than market approvals, resulting in a slight difference between this edition and the last in terms of international NAS availability and sales for 2015. For more details on the change to the methodology, see the Methods section. Assessments are posted on the PMPRB website when they are completed; for updated information see the New Patented Medicines Reported to PMPRB webpage.